Don't go thinking this poster is a small image that I photographed closely. 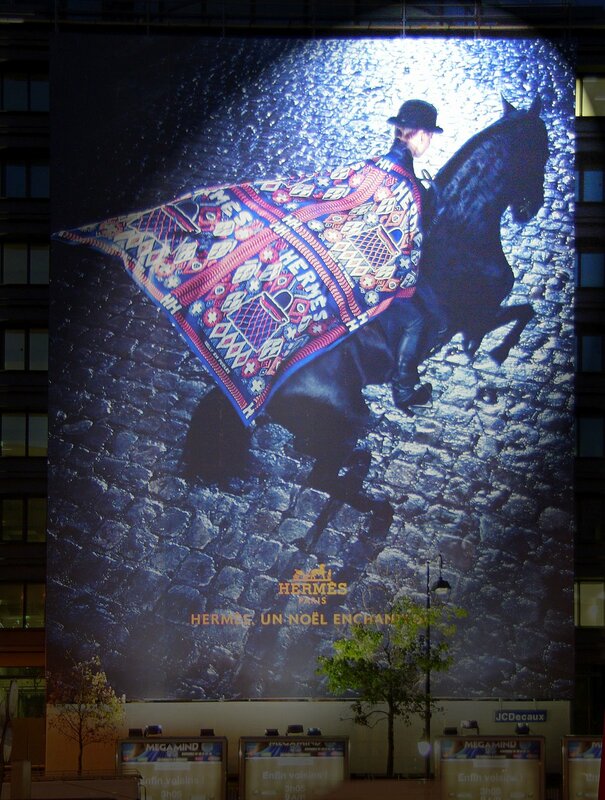 In fact it's a huge Hermès ad on a canvas made to hide a facade while they're doing work in the building behind it. When I saw it at rue du Général de Gaulle in Neuilly (a suburb just outside Paris) I could not help but stop and pull my trigger. Frankly, isn't this photo amazing? Oh yes, this is amazing! I love the blue light. Yes, amazingly beautiful! It sure is. It looks like you took this from a balcony looking down on the scene. Love it. Love this photo...really stunning. The steed is also equally amazing. It is amazing ~ I love it! Judging by the lamppost, this must be huge! Trust Hermes to go overboard—and trust you to find—and share— this. Merci, Eric! I didn't get it at first but if you enlarge the picture and get a look at the trees and the lamppost, you get the perspective. It's huge! it's beautiful ! I love the concept of a scarf being a horseman's cloak. The art director responsible is a genius! It is so beautiful. I remember one like this quite close to the Champs Elysee when I was over last. What a great idea, rather than looking at ugly renos! Thanks for posting! What a great, and HUGE, poster this is. I love the way facades are hidden in Paris. It is so much more inspiring than a simple scaffolding, I just wonder what it looks like from the inside ? Maybe that could be your task to find out, Eric ? When I saw the trees I could see it's a huge photo. It's amazing, yes. Leave it to a Parisian--fabulous! Like the incredible Christmas windows at Printempts. went to see Macy's windows on Sunday and couldn't believe how bad they were in comparison. Is it so hard to be a little creative like they are in Paris??? ?